After you have familiarized yourself with MCA Suite Concepts, you are now ready to setup your instance of MCA Suite. The first thing you should do is add yourself (your personal and company information) as a Contact in MCA Suite. For Contact Type, note that you are either a Funder, Broker or both. Here's a video on how to add yourself (person and company information) into MCA Suite. As seen in the video, when you add a new Person Contact, you can create a new Person and a new Company record at the same time (so creating two records at once) AND automatically associate that Person with the new Company (in this case, yourself and your company). Ideally, you should have a Company setup that is your legal name and DBA. You should also have all your employees as contact (Persons) associated with the Company. A. Admins - Admins can see everything at all times in the CRM; all contacts, all deals, all user tasks, all reports, all sections of the application. B. Agents - Agents have much more restrictive access. Agents will only be able to access the records they have been given permission to view. Agents do not have the ability to delete deals. Agents are able to upload files and documents to MCA Suite, but can only delete the attachments that they have uploaded (i.e., Agent A cannot delete the files Agent B uploaded to a deal). Agents also do not have access to the Administration, Payment Gateways or Reports sections of the application. 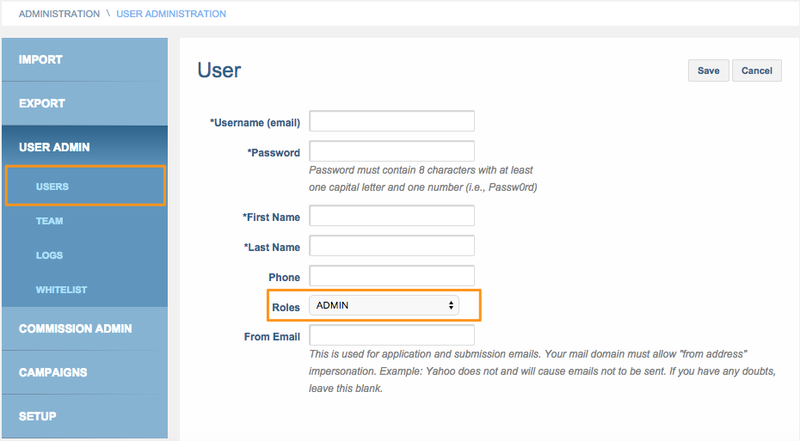 To add new users, go to Admin > User Admin > Users and complete the required fields. The second step is to configure your MCA Suite account to support your business. To do so, go to Admin > Setup > Account Configuration. The Account Configuration section is where you customize your instance of MCA Suite with information specific to your company (whether you are a funder, broker, or investor). A. In the Account Configuration tab, you can set up your “Time Zone” for your MCA Suite instance. This will be the time that displays for any time-stamp in the CRM. B. Since you can send out email correspondence right from MCA Suite, we need you to identify a “From Email Address” in this section. This address will be the default email address used to send outgoing mail from your MCA Suite instance. Ideally, we want this email to be your global inbox; this way, you can have someone check that inbox if a recipient simply clicks on “Reply” when answering correspondence from this email address. C. Every record you create in MCA Suite, whether it’s a company, a person or a deal, can be assigned with specific access permission: either “Everyone” (the most inclusive setting) or “User,” which means only the user who created the record (Admins can always see everything; permissions are set to determine which Agent users can access these records). In Account Configuration, you can set a “Defaults,” so that every new contact or deal will be automatically set to a preferred permission setting. For example, you might want ALL records to default to the more restrictive setting (“User”) for security purposes. 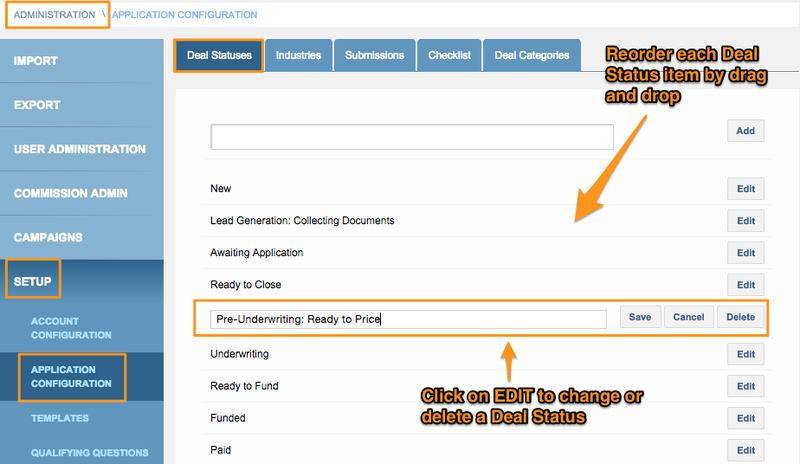 In the same section, you can set your preferred default deal status when creating a new Deal/Application. You can set Default Deal Names when new Deals are created in the MCA Suite. Similar to the default deal status, you can also set your preferred default contact status when creating a Contact. This means when a new contact (person) is created, it will have the default status (i.e., Lead in the example above), which can be changed by the user. D. Deal Stages are system-generated (not configurable) statuses or categories that help identify where a deal is in its current workflow. You can choose to enable Deal Stages by selecting "Yes" or hide it by selecting "No." 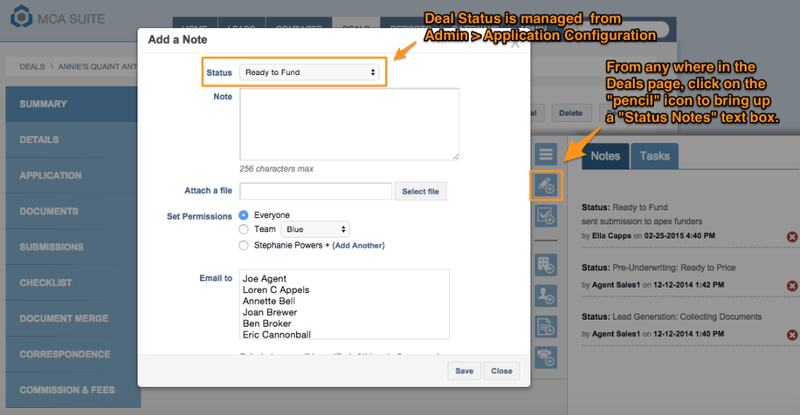 Refer to the MCA Suite Concepts for more information on Deal Stages vs. Deal Statuses (which users can configure). E. The Leads tab is basically a list of Contacts that currently have a "Lead" or "Assigned" contact status associated with them. This tab/page is used mainly by Brokers/ISOs to manage their call-center agents' calling list. You can choose to enable the tab by selecting "Yes" or hide the tab by selecting "No." Refer to the MCA Suite Concepts for more information on Contact Statuses. F. As part of Account Configuration, you should also enter your company address/contact details in the “Business Name and Address” section. These are optional fields, but information here can be used for document merge purposes (i.e., an application or contract that includes your business information). 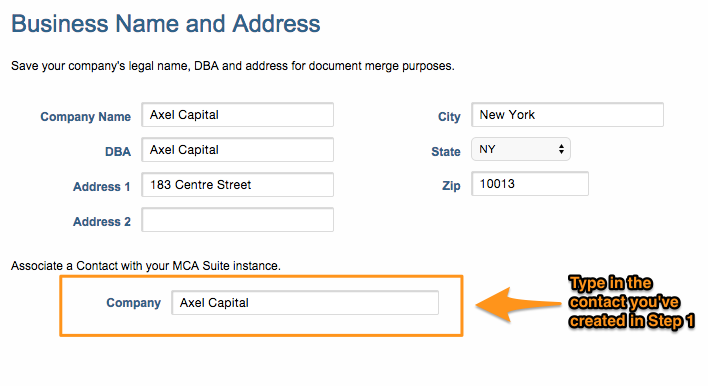 You should also associate a Contact with your MCA Suite instance (contact you've created in Step 1 of the Setup). G. You can upload your company “Logo” to brand your MCA Suite instance. MCA Suite requires a logo to be in this size: 250px x 52px. H. The Account Usage section is for your reference on how many disk space and user licenses you have consumed. 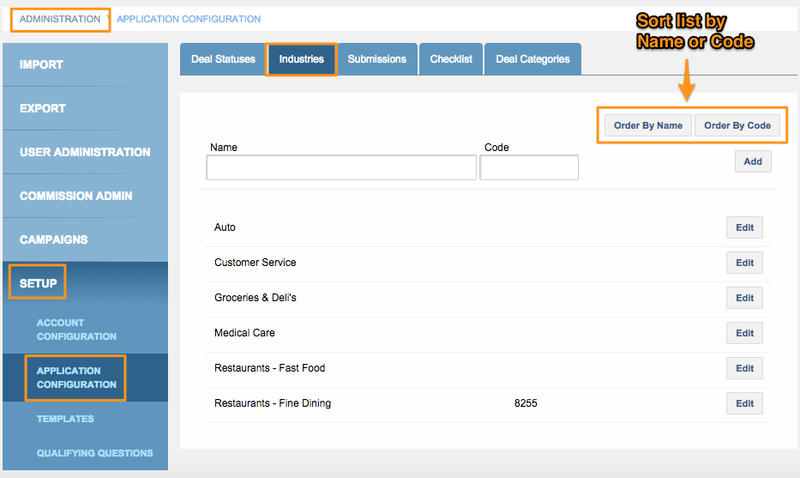 Next, you can customize the behavior of the application to accommodate your company’s workflow. You can define the types of available statuses for a deal. Doing so allows you to track the progress of a deal effectively, in a way that makes the most sense for your business. It will also drive much of the reporting that MCA Suite generates. Here you can define one or more deal statuses. This list will be displayed in the “Status” drop-down of the “Add a Note” window available on any deal page. 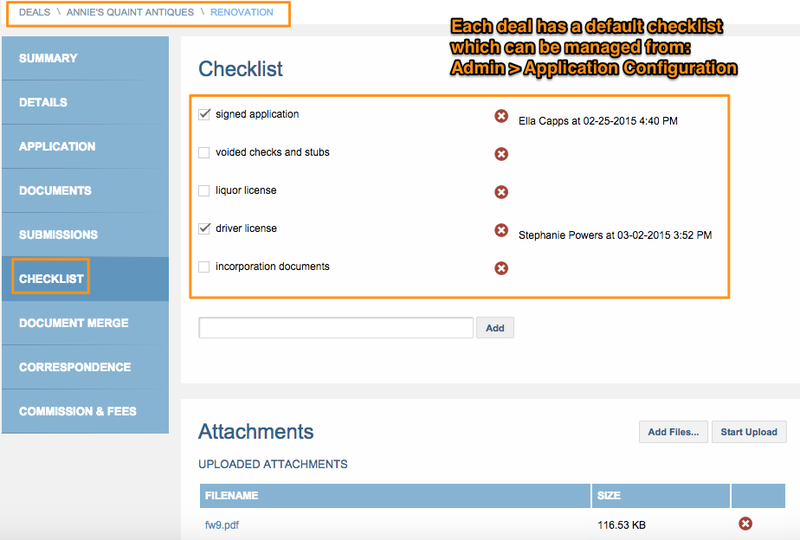 You can adjust the display order of the deal statuses by simply selecting and dragging each status on the Application Configuration page. 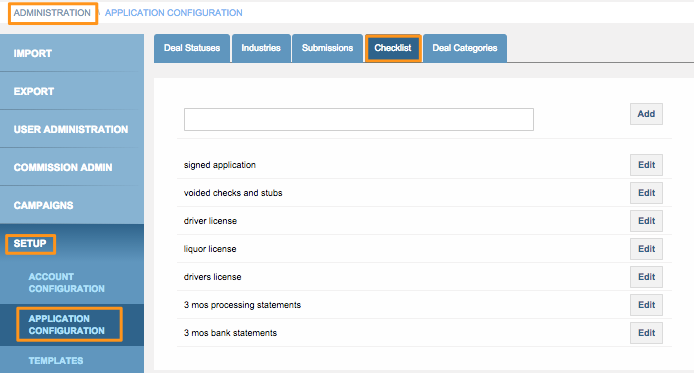 Like deal statuses, you can define the “Industries” you want available in your MCA Suite instance. Industry assignments are useful if you would like to track your merchant leads on a more granular level. You can create a code to be associated with each industry - for example, if you want to use the top level SIC code. 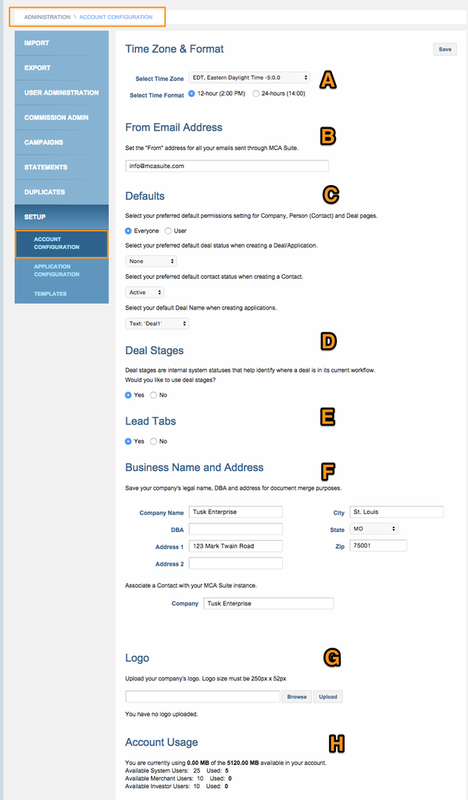 You may want to categorize your contacts by predefined industries such as “Groceries & Deli's”, “Automotive”, or “Retail.” Doing so will let you determine which industries generate the most leads, which are the highest performing industries, and any other metric that can be quantified via reporting. There is a drop-down called "Industry" for every company record in MCA Suite, which pulls the items from this list. To set up industries, go to the Admin > Setup > Application Configuration and browse to the “Industries” section. Add as many industry categories as you’d like - you can always delete or edit any industry you enter. Like with deal statuses, you can drag and re-order industries to make them display in any order you prefer. A Submission Status is used when a deal is being submitted to one or more funders for funding consideration. 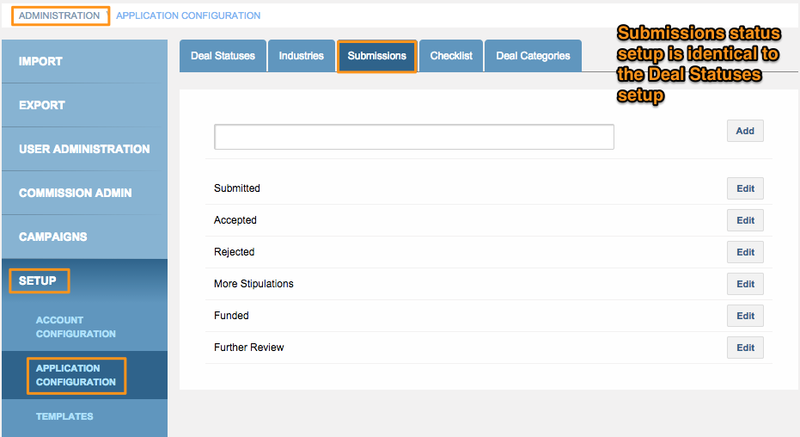 When you are submitting deals to multiple funders, you will use submission status to track the progress of each submission. Submission statuses are often used by Brokers/ISO's. An example of how this may be used by a funder is when a funder collects information about a merchant and decides not to fund the deal. That deal can then be submitted to other funders for consideration to fund. In this scenario, the other funders may require different documents and stipulations to fund the merchant. “Submission status” can be used to keep track of each submission made to individual funders. Submission statuses are generally a subset of the deal status. To set up submission statuses, go to “Admin > Setup > Application Configuration and scroll to the “Submission Status” section. 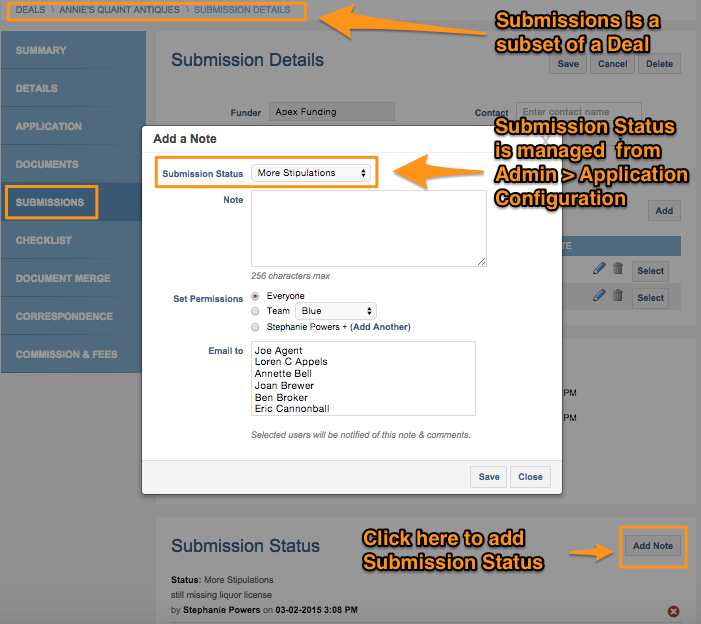 The user interface for Submission Status is similar to the Deal Status section where you can drag and drop each item to reorder the drop-down list. Within each deal is a “Checklist” page/tab, which contains a list of action items to help you keep track of the important materials and documents received - or yet to be received - as part of the underwriting/merchant evaluation process. Since tracking this progress is an important step that is unique to every MCA business, we allow you to fully customize your own checklist with the items most relevant to your underwriting process. To set up your checklist, go to Admin > Application Configuration and browse to the “Checklist” section. Simply enter the items you will require for every deal/merchant underwriting process. You can edit, delete or add new checklist items at all times. This checklist will serve as your CORE checklist, and will appear for every deal (in the “Deal > Checklist” tab as shown below). However, in addition to the core checklist that remains the same for every deal, you can also add new and unique items for one specific deal checklist. These “new” checklist items will appear for that one deal checklist page ONLY and will not be added to your core “default” checklist. Like with “Industries,” “Deal Categories” are a way for you to further classify and order your cash advance deals. For example, you can separate deals into Micro Loan, High Yield, etc. This field is optional but can be useful if you need to categorize your deals on a more granular level. 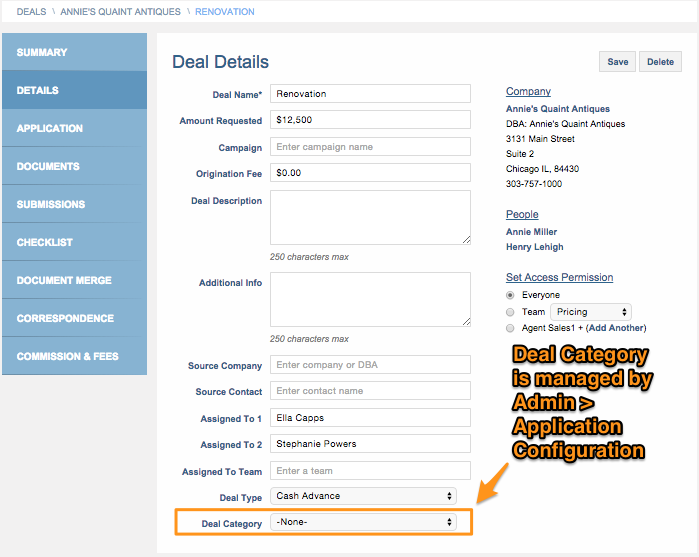 To define new categories, go to Admin > Setup > Application Configuration and browse to the “Deal Category” section. Deal categories are selected from the “Deal Categories” drop-down menu on the Add or Edit Deal page. MCA Suite has a section for you to set up templates that can be reused throughout the application. MCA Suite can help you customize documents you may use on a regular basis - such as form letters, applications or contracts - with your deal and merchant-specific info using our “Document Merge” feature. There is a Document Merge tab associated with every deal. This feature replaces MCA-specific tags in your document with custom content related to a deal rather than you having to retype that information repeatedly. First, you need to decide which documents you would like to merge through MCA Suite. We have a “merge code” library that users can access to see which tags are available and how they relate to fields in MCA Suite. 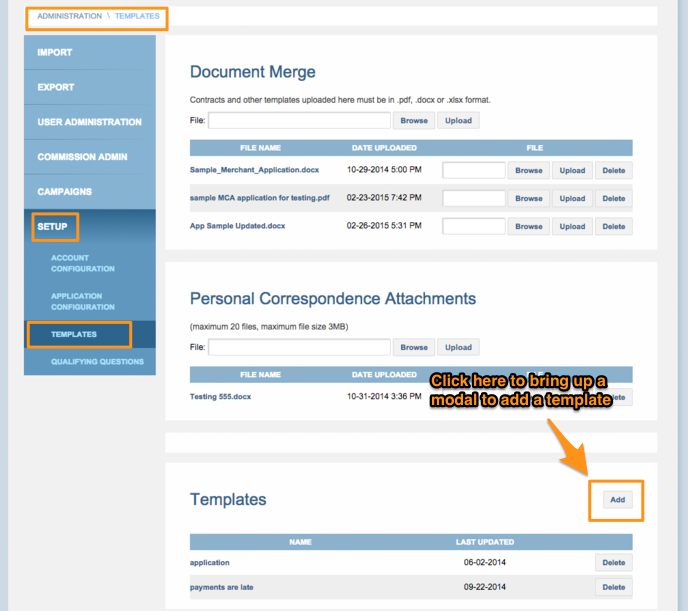 Once the template documents are tagged, you can upload them to MCA Suite by going to Admin > Setup > Templates, and browsing to the “Document Merge” section. The document files must be in .docx, .xlsx or PDF format. After you have uploaded your preferred template files, you can initiate the document merge by going to any deal, and then to the “Document Merge” tab. Here you will see a listing of all the files you have uploaded to the Admin > Setup > Templates > Document Merge section. Simply click on the format icon to the right to perform the document merge. Once it’s complete, you will be prompted to download the updated document. There are two ways to send emails from MCA Suite - at the deal level, or from the person contact page. In the first case, any files uploaded to the deal via the various Documents pages will display in the email modal window. 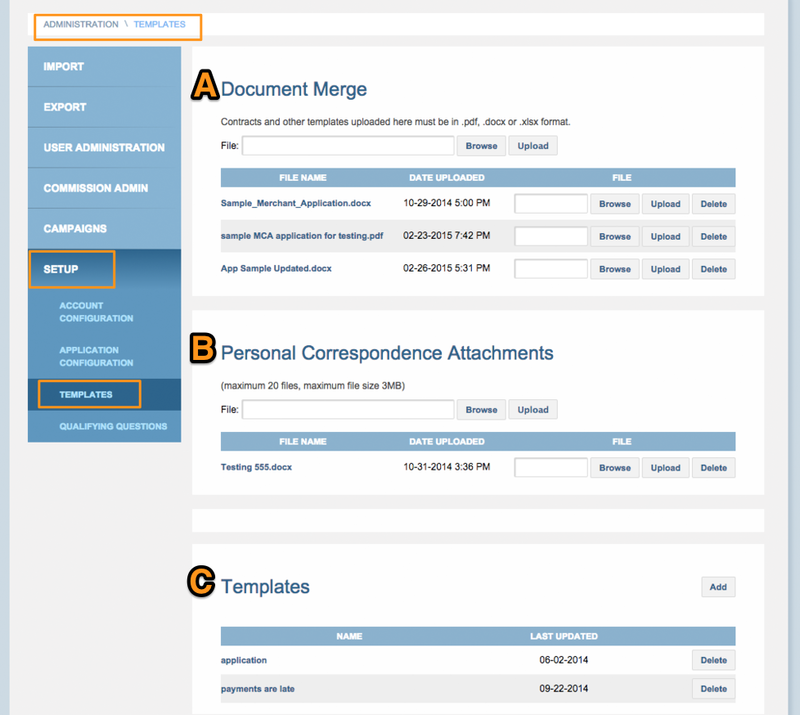 In the second case, you can use the “Personal Correspondence Attachments” section in Admin > Setup > Template to determine which files will be available to attach to personal contact correspondences. Simply check off whichever files you want to send with the email. 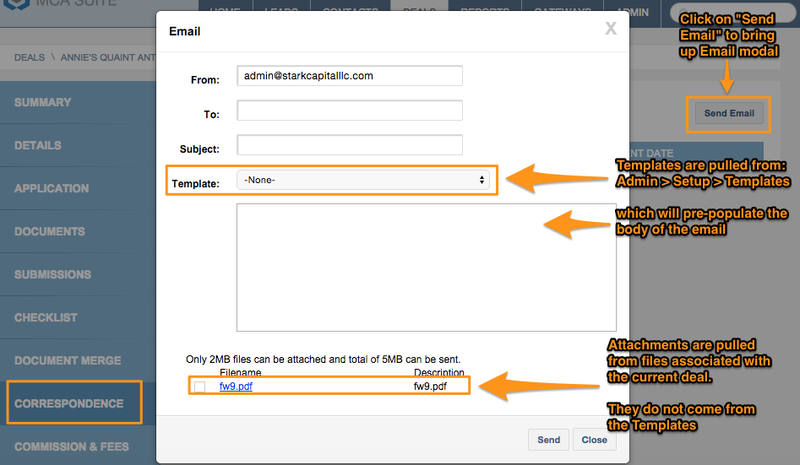 MCA Suite can help you create email templates for correspondences. To do so, go to Admin > Setup > Templates and browse to the “Templates” section. 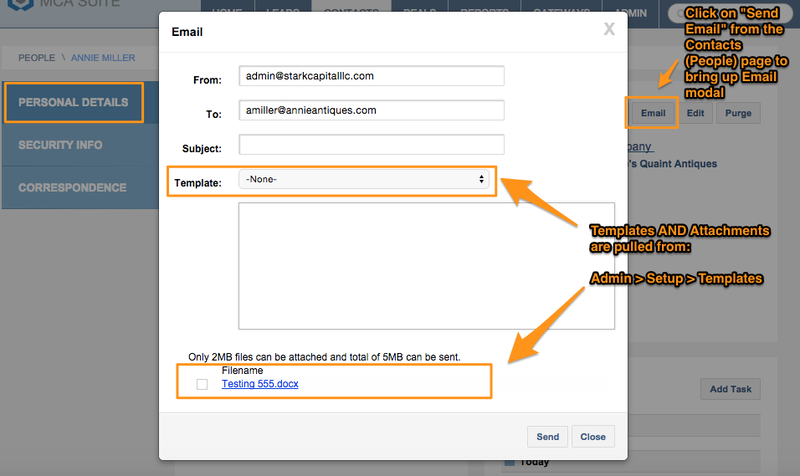 Here, you can create a few templates with boilerplate language to include in the body of an email. This is intended to save time if you have a generic correspondence to send, such as emails explaining that specific applications or contracts are attached that await completion by the recipient. 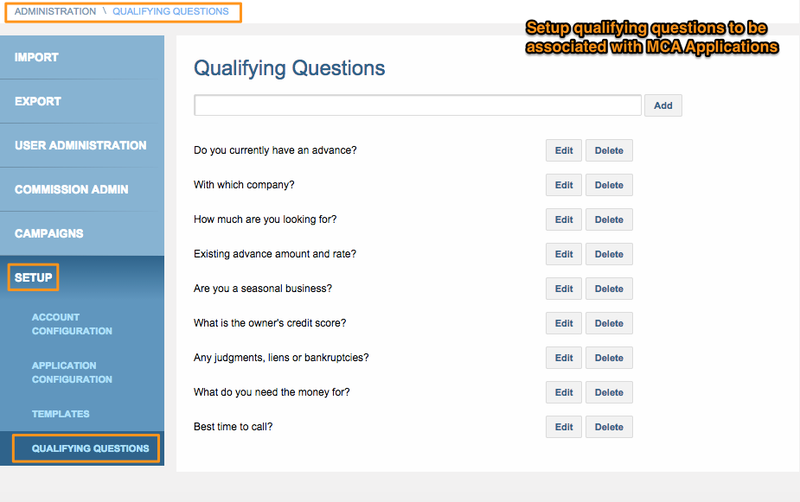 To manage the list of qualifying questions, go to Admin > Setup > Qualifying Questions add, modify and remove questions to be associated with each Deal.